Even though eggs are considered to be one of the most protein-rich foods out there, they can still be harmful for some people. Namely, if you happen to experience diarrhea after egg consumption, you might be suffering from some conditions which disallow you to digest this type of food properly. One of the most common reasons behind egg-induced diarrhea is an egg allergy. This allergy, as well as all others, takes place due to our organism's misconception. It sees proteins from the eggs as harmful for your organism, even if they are actually not. This leads to an allergic reaction, causing our organism to trigger the release of certain chemicals which are supposed to fight off the “intruding” egg proteins found in our body. These chemicals may cause numerous skin, respiratory, and other problems known as allergic reactions. Diarrhea can easily be one of the symptoms connected with an egg allergy. Apart from having diarrhea, you may suffer from numerous other allergic reactions whenever you eat eggs, taking into consideration that you are allergic to them. Your mouth and some of the surrounding organs may swell or have hives and blisters appear upon them. Moreover, your digestive system may be malfunctioning, triggering numerous discomforts like pain, stomach cramps, and vomiting. Finally, your respiratory system may encounter problems as well, causing you breathing difficulties, asthma, wheezing, as well as a runny nose and watery eyes. Therefore, after experiencing diarrhea within several hours after eating eggs, you might want to seek medical assistance. An allergy specialist will perform numerous tests, on you, and diagnose you with an allergy or prove your doubts wrong. Apart from blood tests, taking skin and sweat samples as well as other methods, you doctor may closely observe your behavior and symptoms after eating eggs. If you happen to have negative reactions after consumption, he or she will have more reason to believe that you are allergic to eggs. 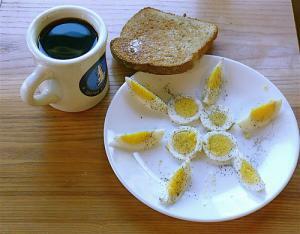 In case you happen to have an egg allergy, you will have to avoid eating eggs completely. This includes all other food types which have eggs as ingredients. Therefore, it is best to seek professional advice from a dietician or a nutritionist. Also, you will need to pay close attention to ingredient lists on all products you consume, making sure they do not have eggs listed on them. All in all, this is a hard process to endure and it requires a lot of sacrifice and lifestyle modifications. But, in the end, you will surely benefit since all the side-effects of egg consumption will be out of your life. Can I use claritin as a substitute for clarinex?